Abraham Lincoln, also released under the title D. W. Griffith's "Abraham Lincoln", is a 1930 pre-Code American biographical film about Abraham Lincoln directed by D. W. Griffith. 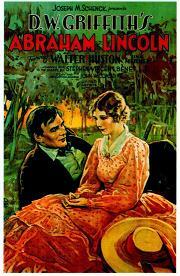 It stars Walter Huston as Lincoln and Una Merkel, in her second speaking role, as Ann Rutledge. Her first speaking role was in a short film, Love's Old Sweet Song (1923) filmed in the Phonofilm sound-on-film process. The script was co-written by Stephen Vincent Benét, author of the Civil War prose poem John Brown's Body, and Gerrit Lloyd. This was the first of only two sound films made by Griffith. The film entered the public domain in 1958 when the initial copyright expired. The copyright holders did not elect to extend it for a second 28 year term. The first act of the film covers Lincoln's early life as a storekeeper and rail-splitter in New Salem and his early romance with Ann Rutledge, and his early years as a lawyer and his courtship and marriage to Mary Todd in Springfield. The majority of the film deals with Lincoln's presidency during the American Civil War and culminates with Lee's surrender and Lincoln's assassination at Ford's Theatre. The film received positive reviews from contemporary critics. Mordaunt Hall of The New York Times called it "quite a worthy pictorial offering with a genuinely fine and inspiring performance by Walter Huston in the role of the martyred President" and later put it on his year-end list of the ten best films of 1930. "More than an outstanding classic of sound pictures, Abraham Lincoln eclipses the most conservative illusion of a modernized Birth of a Nation", wrote Variety in a rave review. "It is a startlingly superlative accomplishment; one rejuvenating a greatest Griffith. In characterization and detail perfection it is such as to be almost unbelievable." Film Daily called it a "distinguished and human narrative" and wrote that Huston's performance "may be listed as one of the 10 best of the year – or any talker year." John Mosher of The New Yorker wrote that it was "by and large.....a pretty high-grade picture." Despite these accolades, however, the film's box office performance was uneven. The film covers some little-known aspects of Lincoln's early life, such as his romance with Ann Rutledge, his depression and feared suicidal tendencies after her death, and his unexplained breaking off of his engagement with Mary Todd (although the film surmises that this was due to unresolved feelings over Ann Rutledge and adds a dramatic scene where Lincoln stands Mary up on their scheduled wedding day, which did happen as we now know). While the early scenes of Lincoln's life are remarkably accurate, much of the later scenes contain historical inaccuracies. The famous Lincoln-Douglas debates, in addition to the historically accurate topic of the extension of slavery, have been turned into an argument about secession. Lincoln was famously an underdog for the Republican Presidential nomination in 1860; in the film it is suggested he is the sole nominee as a result of the Lincoln-Douglas debates. The outbreak of the Civil War seems to be the Union firing on Charleston, South Carolina from Fort Sumter, rather than the other way around. Also, early in hostilities, General Winfield Scott is depicted as being overconfident of a quick victory (and something of a buffoon), when in reality he was one of the voices in the minority claiming the war would be long, costly, and bloody. Lincoln receives a report from the Secret Service that some copperheads in the North have issued threats against him. The Secret Service was not created until two months after Lincoln's death. Finally, in the climax of the film, Lincoln delivers a conflation of famous words from the Gettysburg Address and Second Inaugural Address at Ford's Theatre on April 14, 1865 – just moments before being assassinated. This was Griffith's second portrayal of Lincoln's assassination, the first being in The Birth of a Nation. Abraham Lincoln is part of the David Wark Griffith collection at the Museum of Modern Art, and it was donated as a gift from screenwriter-producer Paul Killiam, a noted collector of silent movies. Funding for the preservation of this film was provided by The Lillian Gish Trust for Film Preservation, The Film Foundation, and the Hollywood Foreign Press Association. More recent assessments of Abraham Lincoln have been less effusive in their praise of the film, finding that Abraham Lincoln has not aged well. In 1978, the film was included as one of the choices in the book The Fifty Worst Films of All Time, criticizing the film's historical inaccuracies, instances of clumsy dialogue and Merkel's melodramatic acting style. Glenn Erickson, reviewing the DVD in 2012, wrote that it "comes off as an interesting curio. Its earnest simplicity seems more dated than ever, despite the fine performance of Walter Huston in the lead role." Film historian Melvyn Stokes found that Abraham Lincoln's episodic structure "came at the cost of dramatic tension" and suggested that the film's disappointing box office performance was due to its having "nothing of major importance and relevance to say about its subject to moviegoers of Depression-era America." Abraham Lincoln was the first sound film about the Civil War which veterans of that war could view. ^ Paolo Cherchi Usai (2008). The Griffith Project: Essays on D.W. Griffith. British Film Institute. p. 208. Retrieved January 16, 2016. ^ Christley, Jaime N. (15 December 2012). "Abraham Lincoln". Slant Magazine. Retrieved 15 January 2016. ^ Hall, Mordaunt (August 26, 1930). "The Screen; Mr. Griffith's First Talker". The New York Times. Retrieved March 27, 2015. ^ The New York Times Film Reviews, Volume 1 (1913-1931). The New York Times & Arno Press. 1970. p. 684. ^ "Abraham Lincoln". Variety. New York: Variety, Inc.: 21 August 27, 1930. ^ "Abraham Lincoln". Film Daily. New York: Wid's Films and Film Folk, Inc.: 10 August 31, 1930. ^ Mosher, John (September 6, 1930). "The Current Cinema". The New Yorker: 62. ^ Stokes, Melvyn (2007). D. W. Griffith's the Birth of a Nation : A History of the Most Controversial Motion Picture of All Time. Oxford University Press. pp. 267–268. ISBN 9780198044369. ^ "Abraham Lincoln (1930)". Museum of Modern Art. Retrieved January 15, 2016. ^ "Abraham Lincoln (1930)". FilmFanatic. Retrieved March 27, 2015. ^ Erickson, Glenn (November 21, 2012). "Abraham Lincoln". DVD Savant. Retrieved March 27, 2015. ^ Strokes, Melvyn. "D. W. Griffith's Abraham Lincoln." Presidents in the Movies: American History and Politics on Screen. Ed. Iwan W. Morgan. Palgrave MacMillan, 2011. p. 58-61. ISBN 9780230117112. Wikimedia Commons has media related to Abraham Lincoln. This page was last edited on 7 February 2019, at 18:00 (UTC).